I love cookies. Especially chocolate chip cookies! 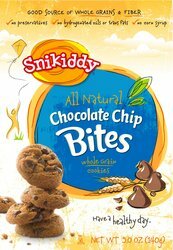 That’s why I was excited to try Snikiddy All Natural Chocolate Chip Bites. Delicious! The cookies are definitely bite sized, about the size of a half dollar or a big bigger than a quarter. The have big chocolate chips, or chunks rather dispersed in each bite sized cookie. They also have a slight hint of a caramel/molasses taste to them, but not overpowering. They are sweet, but again not TOO sweet, so they are good. The texture is sort of like when you make home-made cookies, the day after. They aren’t super soft like homemade, but not hard like chips ahoy. A bit of a happy medium and are crumbly as they are tasty. Honestly, I liked them. They were really good with a glass of milk. I was also happy to know that each serving ( 5 cookie bites) had 3 grams of fiber. Yay! Want to get a free coupon for $1.00 these cookies? Visit their website ! 5 cookie bites (28g)- 130 calories, 5 grams of fat, 19 carbohydrates, 3 grams of fiber, 2 grams of protein. Whole Wheat Flour, Semi Sweet Chocolate Chips (Evaporated Cane Juice, Chocolate Liquor, Cocoa Butter, Soy Lecithin, Ground Vanilla Beans), Evaporated Cane Juice, Butter, Sunflower Oil, Molasses, Oat Fiber, Baking Soda, Vanilla Extract, Natural Flavor, Salt.